. Awarded 2nd place honours for " back country, west coast"
" When the sun kisses the land"
​I have coined the term " hieroglyphics" to describe the creation and incorporation of symbols, shapes, forms and marks to create a personal language on canvas. As a student of Joseph Albers experimental colour methods, this latest series explores the interplay and interactions of colour to create unique colour stories to engage the viewer and encourage conversations about colour in a contemporary context. In " A book of Luminous Things" Czeslaw Milosz writes that " To create art is to capture an epiphany. Epiphany may mean a privileged moment in our life among the things of this world in which they suddenly reveal something we have not noticed until now; and that something is like an intimation of their mysterious, hidden side. " Currently my painting process is in colour experimentation in the realm of abstract landscape expressionism . I am focussed on the play of line energy and colour relationships in the landscape and my connection to that landscape - land to sky to water to trees. I am creating colour ideas in a sensual context ; colour interplay on a flat surface - moving into abstraction from realistic scenes . For me , colour interplay creates an emotional reaction and energy that expresses my own connection and history with the Canadian landscape . 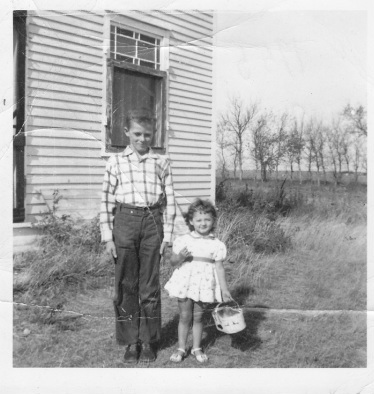 I was born a prairie girl. It stays with you for life no matter how far you travel or how long you are away. There is a connection with the open sky and the dark rich earth that runs through your soul. I have lived a long time away from the prairies of yellow wheat and blue flax and small towns and big skies. I have lived in five of ten provinces in Canada and have travelled to all except the territories . I love all that Canada is and all it has to offer us if we open ourselves to its gifts. After completing my Emily Carr Certificate Program I knew I had to follow words that echoed in my head from Robert Genn - go to your room and paint. In 2016 I devoted my time to discovering my own style, and more particularly , what I wanted to say in my painting. I made decisions - to paint on larger canvases; to continue my exploration of colour and to use the natural landscape as a subject on which to develop a series of work . My interest lie of colour, shape , line and form through the creation of individual colour stories within each contemporary landscape that I chose to paint. Certain colours attain superiority. Colours can also deceive. Every person perceives the truth of colour differently. I term these colour stories " Colour Hieroglyphics". my ideas, my creations. I chose not to share my work or talk much about it as I wanted not to be influenced initially by any outside conveyer of comments. It was a productive and satisfying year and now I know how to be reclusive when I need to be alone in my studio and what a great joy painting gives me. I left the aggravation of offices and meetings and commuting and began a new journey .I loaded up on art books, absorbed every gallery opening I could make time for , began studio classes, roamed the internet for inspiration and embraced the creativity of workshops.
" Oil Painting I and II" with James Lindfeld . It is really a thrill to work with creative people of all stripes . What would our world be without such people to bring us laughter and joy and inspiration and ideas and a community of sharing their innermost creative journeys? I joined the North Shore Artists Guild [ NSAG] . I attended Robert Genn's presentation at the Harmony Arts Festival in West Vancouver and embraced his " Two Dozen Keys for Painterly Happiness and Success". This was the year of searching out my own style and dreams in painting . I spent time wandering around southern France and absorbing the places of Van Gogh and Picasso to name just two of my favourites. I studied the American painters of the late 1800's and early 1900's; fell humbly in love with deKooning's brushstrokes and studied Turner's light made illuminating with whites and yellows and blues and reds.... I painted my "Transformation" canvas to capture the light of the Prairie sun and my own transformation in becoming an artist. I also painted with Alfonso Tejada in his workshop " Painting Out Loud". I loved his theme of embracing colour ..... one of my themes as well.
" Acrylic Painting II" with Elizabeth Barnes. I also experimented with watercolour in " Learn to Paint with Watercolour" with Elizabeth Cox and started to sketch more . I enjoyed the drawing demonstration with Bill Higginson entitled " Quick on the Draw" also at the Harmony Arts Festival in West Vancouver. Paint, paint, paint....... I'm constantly reminded to go to my studio and create and after I paint 10,000 paintings I might actually learn something . Van Gogh constantly wrote to his brother about the mistakes in his current painting that he intended to fix in his next painting and so on and so on. I enjoy working on 6 x 6 canvas paper to be free with my brushstroke and colour mixing studies..... I learn a lot from each one and each one reminds me of the joy of discovery. I took more Emily Carr certificate classes this year including Francis Grafton's " Drawing Fundamentals in Composition and Form and discovered my mark making and brush stroke energy I have been working on for awhile . This was a really excellent class at Emily Carr. I also completed " Composition & Process" with Elizabeth Barnes and then Advanced Colour Theory II , again with a magnificent colourist at Emily Carr- Elizabeth Barnes. [ She complimented me on my colour discords , and thought my work on the subject worthy of a show..... I'll thank her forever for her ongoing encouragement and support on this journey of mine] . In August I travelled to Hollyhock on Cortes Island for the Painting Plein air with Robert and Sara Genn. This experience will keep me inspired for many months and years to come. [ Additional note: I am so grateful I made it to Hollyhock . Now Robert continues to be with me in spirit and through his ongoing letters and Sara's online at Painter's keys. Hiis passion for artists and life and nature are part of my own artistic psyche and Sara is carrying on with weekly letters that continue to bring me inspiration and knowledge]. Two works contributed [ and sold] at the " Then & Now" Art Exhibition at the Britannia Art Gallery on the Drive . I participated in the Anonymous Show at Cityscape Gallery in North Vancouver as well. I have completed all of my mandatory classes now in the certificate program and am free to choose classes now . With any luck I may complete the program in 2015 and achieve another milestone. Stay tuned. Before painting there was photography and underwater photography in particular . I have travelled to many "National Geographic" locations in the world , from PNG to the Solomon Islands to Myanmar .... diving, exploring , and connecting to our wondrous world of people and things..... travel is a joy . I have been exceptionally quiet on my website this year but I have had a very rewarding year in so many ways. First and most importantly was the completion of a major milestone - obtaining my advanced painting certificate through Emily Carr University of Art & Design. I still remember my very first day of class with James Lindfeld when I was terrified I couldn't possibly be accepted into such a prestigious school and survive , let alone thrive. James was very very tough on me - perhaps because he saw how much I wanted to be there and to learn and he set the stage for me to understand like everything in life, if you want to do something and you are prepared to work very very hard....... then everything is possible. My last two classes were with Elizabeth Barnes and I will be forever grateful to her for her knowledge and expertise in colour theory and colour generally [ among many of her skills] and her willingness to mentor me and basically put up with my incessant questions . I took many classes with Elizabeth over the past four years so I was happy to finish my certificate journey with her . I have gained so much through this program, not the least is the joy of meeting so many talented and enthusiastic and creative people .